Vietnam Airlines, a SkyTeam member, has been flying direct seven days a week from between London and Vietnam since 23 June 2016. 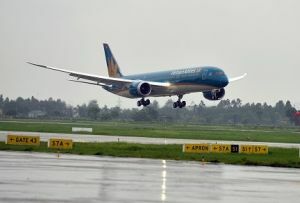 The carrier is using its new Boeing 787-9 Dreamliners and there are currently four non-stop flights a week to Hanoi on Sundays, Tuesdays, Thursdays and Fridays, and three to Ho Chi Minh City (Saigon) on Mondays, Wednesdays and Saturdays. Vietnam Airlines uses Heathrow Terminal Four, many people’s favourite since it’s had a recent makeover and is relatively uncrowded. 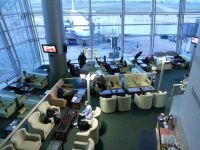 The SkyTeam lounge covers two floors and has all the usual facilities including a spa. In the morning, a hot breakfast was being served upstairs, although the cold buffet was short on croissants and pastries. My flight left on time and the Business Cabin has a clever herringbone seat arrangement giving direct access to the aisle. The 28 seats are in seven rows with a 1+2+1 formation, a comfortable width of 21in (53.3cm) and a recline of 180 deg. That means the seat converts to a fully-flat bed, connecting with a padded ottoman in front. There are ample storage facilities, with a receptacle for two bottles of water, a secret cupboard next to the pop-up armrest and a space under the ottoman to store shoes. Steps built into the side of the base of the seat help passengers to reach into the overhead lockers. Although I didn’t test it, wi-fi is provided. There is a USB port and a universal power socket. The 15.4in HD touchscreen pops out of the wall and angles towards the passenger. IFE offers a blend of international, classic and Vietnamese films, although they all seemed to have Vietnamese onscreen subtitles which couldn’t be removed. Ironically, none of Vietnamese movies had English subtitles – a shame, as the international selection was limited. The crew stowed coats and champagne was offered before take-off and an amenity bag and slippers were provided. Once airborne, although there were cocktails on the menu, they didn’t appear as the food service was rolled out immediately. Strangely, there were no wines listed, so the crew had to bring the bottles to show what was available. The range was limited to a couple each of reds, whites or rosés, although all were fairly decent. Appetisers offered a choice of smoked salmon or paté followed by fresh vegetable salad and asparagus and courgette soup. Main courses were crab cakes with smoked garlic sauce, lamb loin with herb crust, grilled Thai chicken, or fried cod with orange sauce. There was no vegetarian option and I was told my fish choices were not available. I settled for paté but miraculously the fried cod suddenly appeared. Wine top ups were not offered and had to be called for. The desserts offered cheese, fresh fruits, miniature pastries and ice cream. The meal was served quickly and all dishes were well presented and tasty. Unfortunately it was only some 10 hours later, just before landing, that hot breakfast was offered. In between, even though the menu stated sandwiches, fresh fruits, cakes, mixed nuts and instant noodles were available, nothing appeared. Since it was a day flight, I requested something to nibble, half way in, but all they could serve was cheese left over from lunch. Breakfast was yoghurt or cornflakes, then a choice of omelette with sausage and mushroom or a cold plate of cheese, salami and smoked turkey or crayfish with noodles. The flight arrived slightly early and baggage was delivered quickly. British travellers don’t need a visa to enter Vietnam so immigration was a breeze. One minor inconvenience was that there was no water in the washbasin in one of the toilets, although a bottle of water was provided for me to wash my hands. The return flight left Ho Chi Minh City at 00:45 and again the meal was served immediately after take-off. This time it made sense, as everyone wanted to get some sleep. Appetisers were either roast beef with grilled zucchini and pepper or marinated scallops, green mussels and prawns in lemon grass. Main course was coq au vin or grilled pork loin with crab cake or beef wrapped in lemongrass, Again there was no vegetarian option but at least all choices seemed to be available. Dessert was a choice of Vietnamese sweet soup or cheese mousse. 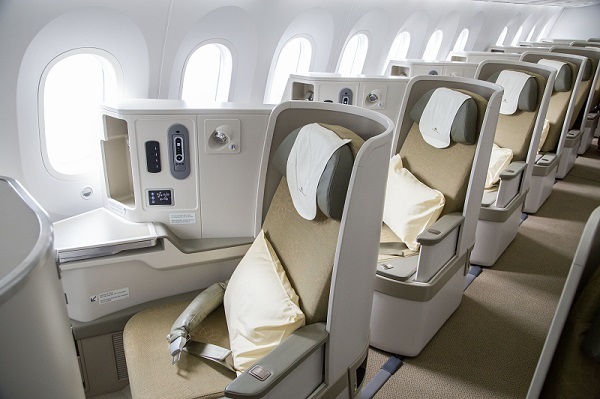 The fully-reclining seats meant that it was possible to get a good night’s sleep, probably helped by the Dreamliner’s near-normal cabin pressure. Breakfast was similar to the outbound flight but offered hot Pho – Vietnamese beef noodle soup, which was remarkably authentic. All flights operated on schedule. Service was courteous, although some of the staff seemed to have only a limited grasp of English. 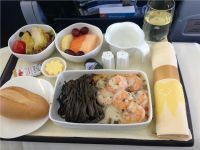 It wasn’t quite up to the standard of Cathay Pacific or Singapore Airlines, but Vietnam Airlines has come a long way in just over four years. What’s more, the fact that flights are direct means travelling to the country is accomplished with a minimum of tiredness.